Hamburg is an important port in Germany. It was therefore a major target of the RAF during the Second World War. Between 1940 and 1945 Bomber Command carried out 187 air raids on Hamburg. With the development of metallises strips it became much safer for the RAF to launch air attacks on Hamburg. The most intensive of these were carried out in July and August 1943 when firestorms caused the deaths of 50,000 people. As a result of these raids over a million people fled the city. The main objection to the use of "Window" (the strips of metallised paper) which proved to be the most important and effective of all the weapons used against enemy radar, continued to be the fear of its effect on our own defences. It was hoped that our own radar would be developed to the point where the strips of paper would not cause any very serious interference, but even so, defensive radar might never be quite so effective after its introduction as before. When I continually pressed for the introduction of this weapon, other objections were also made. It appeared that we were short of suitable plant for the manufacture of the strips in quantity, and that it would be very difficult to get priority for the supply of aluminum needed. There can be little doubt that if we had been able and allowed to use this weapon in the first months of 1943 we should have saved hundreds of aircraft and thousands of lives and would have much increased the accuracy of our bombing. There was every reason to believe that if the authorities would only allow us to drop strips of metallised paper during our attacks we should hopelessly confuse the enemy's radar on which he relied for the control of his night fighters and the accuracy of his gunfire. Early in 1943 there had already been developed a suitable form of this weapon for jamming the enemy's ground control stations, radar-sighted guns, and airborne radar for interception. And we had already worked out the quantity of strips of paper that would be required, the rate at which it should be dropped, and the areas over which it should be released. It cannot be said that there was ever an occasion when we did not need to use this weapon, but we needed it as much as ever before at the end of July, 1943, and it was just at that time that the Air Ministry after I had urged the use of this weapon at repeated intervals for many months, decided that it was now possible to accept the risk of the enemy using the same weapon against our own defences. The strips of paper-they were given the code name "Window" - were dropped for the first time on the night of July 24th-25th. The target was Hamburg. No air raid ever known before had been so terrible as that which Hamburg had endured; the second largest city in Germany, with a population of nearly 2,000,000, had been wiped out in three nights. And at the same time the whole system of air defence, carefully built up, at the expense of all the other battle fronts in which the Germans were fighting, over a period of years, had been thrown into utter confusion; the night fighters, it appeared, would in future be powerless to detect the bombers in the dark, and the guns and searchlights would be altogether inefficient. The first type of Window used by Bomber Command in the attacks on Hamburg was designed to confuse the enemy's Wurzburgs, used both for ground control of fighters and for gun laying, and we knew at once that it had been successful in this. But the enemy also knew what we discovered later, that Window seriously interfered with the night fighters' airborne radar as well. (2) German report on the firestorm in Hamburg on 24th July, 1943. Coal and coke supplies stored for the winter in many houses caught fire and could only be extinguished weeks later. Essential services were severely damaged and telephone services were cut early in the attack. Dockyards and industrial installations were severely hit. At mid-day next day there was still a gigantic, dense cloud of smoke and dust hovering over the city which, despite the clear sky, prevented the sun from penetrating through. Despite employment of all available force, big fires could not be prevented from flaring up again and again. The alternative dropping of block busters (4000 Ib. highcapacity bombs) high explosives, and incendiaries, made fire-fighting impossible, small fires united into conflagrations in the shortest time and these in turn led to the fire storms. To comprehend these one can only analyse them from a physical, meteorological angle. Through the union of a number of fires, the air gets so hot that on account of its decreasing specific weight, it receives a terrific momentum, which in its turn causes other surrounding air to be sucked towards the centre. By that suction, combined with the enormous difference in temperature (600-1000 degrees centigrade) tempests are caused which go beyond their meteorological counterparts (20-30 centigrades). In a built-up area the suction could not follow its shortest course, but the overheated air stormed through the street with immense force taking along not only sparks but burning timber and roof beams, so spreading the fire farther and farther, developing in a short time into a fire typhoon such as was never before witnessed, against which every human resistance was quite useless. (3) Major-General Kehrl, report on the firestorm in Hamburg in August, 1943. Before half an hour had passed, the districts upon which the weight of the attack fell were transformed into a lake of fire covering an area of twenty-two square kilometres. The effect of this was to heat the air to a temperature which at times was estimated to approach 1,000 degrees centigrade. A vast suction was in this way created so that the air "stormed through the streets with immense force, bearing upon it sparks, timber and roof beams and thus spreading the fire still further and further till it became a typhoon such as had never before been witnessed, and against which all human resistance was powerless." Trees three feet thick were broken off or uprooted, human beings were thrown to the ground or flung alive into the flames by winds which exceeded 150 miles an hour. The panic-stricken citizens knew not where to turn. Flames drove them from the shelters, but high-explosive bombs sent them scurrying back again. Once inside, they were suffocated by carbon-monoxide poisoning and their bodies reduced to ashes as though they had been placed in a crematorium, which was indeed what each shelter proved to be. (4) Wilhelm Johnen, was a Luftwaffe pilot who attempted to protect Hamburg in August 1943. A few days later we heard further details of the agony of this badly hit city. The raging fires in a high wind caused terrific damage and the grievous loss of human life out-stripped any previous raids. All attempts to extinguish them proved fruitless and technically impossible. The fires spread unhindered, causing fiery storms which reached heats of 1,000°, and speeds approaching gale force. 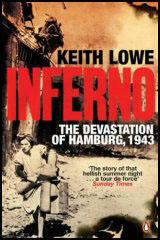 The narrow streets of Hamburg with their countless backyards were favourable to the flames and there was no escape. As the result of a dense carpet bombing, large areas of the city had been transformed into a single sea of flame within half an hour. Thousands of small fires joined up to become a giant conflagration. The fiery wind tore the roofs from the houses, uprooted large trees and flung them into the air like blazing torches. The inhabitants took refuge in the air-raid shelters, in which later they were burned to death or suffocated. In the early morning, thousands of blackened corpses could be seen in the burned-out streets. In Hamburg now one thought was uppermost in every mind to leave the city and abandon the battlefield. During the following nights, until 3rd August 1943, the British returned and dropped on the almost defenceless city about 3,000 block-busters, 1,200 land-mines, 25,000 H.E., 3,000,000 incendiaries, 80,000 phosphorus bombs and 500 phosphorus drums; 40,000 men were killed, a further 40,000 wounded and 900,000 were homeless or missing. This devastating raid on Hamburg had the effect of a red light on all the big German cities and on the whole German people. Everyone felt it was now high time to capitulate before any further damage was done. But the High Command insisted that the 'total war' should proceed. 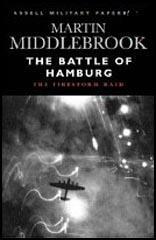 Hamburg was merely the first link in a long chain of pitiless air attacks made by the Allies on the German civilian population. The first bombings of Hamburg started in 1942. The raids increased. In 1943, Hamburg was practically demolished. In three nights, forty-one thousand people were killed. My mother and I were right in the middle of it. On the street where we lived, there was a public air-raid shelter. Every street had to have a shelter, which you could reach in five minutes. I remember one night, about nine o'clock, the siren started wailing. We grabbed our suitcases and made it down. We'd been in this same shelter many, many, many, many nights before. The shelter was packed. There must have been two hundred, most of them neighbors we knew. There was not a moment when there was no Allied aircraft over Hamburg. It was an around-the-clock affair. The British would attack us at night and the U.S. air force in the daytime. This night, about midnight, we heard the bombs dropping. It lasted about an hour. When it was over, we tried to get out, but we couldn't. The building over us was hit by an incendiary bomb and was on fire. The outside walls had collapsed and had blocked the exits. People were running around, getting hysterical. Nobody gets out, they were shouting. About eight the next morning, we heard digging outside. They were removing the walls. We were half suffocated. We couldn't breathe. When we reached the street, that part of Hamburg where I lived was totally burned down. My mother and I made it to an overpass. All the survivors went there. We were picked up by trucks and taken out of the city. In those days, refugees - and we were all refugees now - could use the trains without paying. A wave of terror radiated from the suffering city and spread through Germany. Appalling details of the great fire was recounted. A stream of haggard, terrified refugees flowed into the neighbouring provinces. In every large town people said: "What happened to Hamburg yesterday can happen to us tomorrow". After Hamburg in the wide circle of the political and the military command could be heard the words: "The war is lost". (7) Albert Speer discussed the bombing of Hamburg when he was interrogated in July 1945. We were of the opinion that a rapid repetition of this type of attack upon another six German towns would inevitably cripple the will to sustain armament manufacture and war production. It was I who first verbally reported to the Fuehrer at that time that a continuation of these attacks might bring about a rapid end to the war."